Functional organic materials are already a huge area of academic and industrial interest for a host of electronic applications such as Organic Light-Emitting Diodes (OLEDs), Organic Photovoltaics (OPVs), Organic Field-Effect Transistors (OFETs), and more recently Organic Batteries. They are also relevant to a plethora of functional sensory applications. This book provides an in-depth overview of the expanding field of functional hybrid materials, highlighting the incredibly positive aspects of main group centers and strategies that are furthering the creation of better functional materials. Main Group Strategies towards Functional Hybrid Materials features contributions from top specialists in the field, discussing the molecular, supramolecular and polymeric materials and applications of boron, silicon, phosphorus, sulfur, and their higher homologues. Hypervalent materials based on the heavier main group elements are also covered. The structure of the book allows the reader to compare differences and similarities between related strategies for several groups of elements, and to draw crosslinks between different sections. 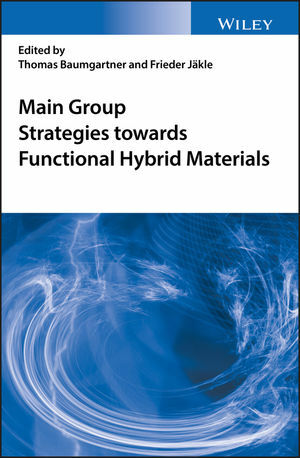 Main Group Strategies towards Functional Hybrid Materials is an essential reference for organo-main group chemists pursuing new advanced functional materials, and for researchers and graduate students working in the fields of organic materials, hybrid materials, main group chemistry, and polymer chemistry. Dr. rer. nat. Thomas Baumgartner, is a Professor and Canada Research Chair in the Department of Chemistry, York University, Canada. He is the recipient of several awards, including a Liebig fellowship from the German chemical industry association, an Alberta Ingenuity New Faculty Award, a JSPS invitation fellowship, and a Friedrich Wilhelm Bessel Research Award from the Alexander von Humboldt Foundation. Dr. rer. nat. Frieder Jäkle, is a Distinguished Professor in the Department of Chemistry, Rutgers University-Newark, USA. He is the recipient of the NSF CAREER award, an Alfred P. Sloan fellowship, a Friedrich Wilhelm Bessel Research Award from the Alexander von Humboldt foundation, the ACS Akron Section Award, and the Boron Americas Award.